Detail, “Height in Your Hat,” Butterick-Companion [?] pattern 7631, November 1937. WHC. Three hat styles in one pattern for 25 cents. A style that combines height with a beret front and a driving cap back, pattern 7631, WHC, Nov. 1937. This one is closest in spirit to the more extreme couture hat designed by Agnes. “Exquisite — Flattering” Paris Fashion Shoes. Ad from Ladies’ Home Journal, November 1936. Black suede side tie shoe, with a very high heel. I hadn’t encountered any other ads for Paris Fashion Shoes, and the very high heels and relatively low prices in the ad intrigued me. Paris Fashion Shoes, center of ad, Ladies’ Home Journal, November 1936. Top, a brown or black square-toe sandal. Paris Fashion Shoes cost just $3 to $4 in 1936. Bottom of ad from Ladies’ Home Journal, November 1936, p. 111. 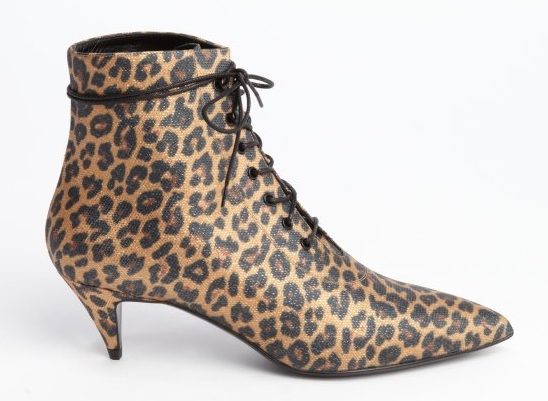 This high heeled “butterfly” tongue step-in was available in “black, wine, or green suede” or in “black or blue kid” — quite a range of choices and sizes. A high-heeled “Foot Rest” shoe from Krippendorf promised comfort, for “$6.95 to $7.95” or more. Ad from WHC, October 1936. I was curious about the Paris Fashion brand, and found that it was only one of many lines made by the Wohl Shoe Company. Wohl owned forty-six trademarks. A 1941 booklet celebrating the history of the Wohl Shoe Company was recently offered on eBay. In 1941, Wohl produced lines called Jacqueline, Natural Poise Arch Shoes, Connie, and Paris Fashion Fifth Avenue Shoes. Click here. A selection of shoe ads from Woman’s Home Companion, also from 1936, shows that Paris Fashion Shoes were relatively low-priced, compared to other brands. You can tell from the names of the companies, however, that these ads were aimed at women who wanted shoe comfort as well as style. Enna Jettick shoes cost $5 to $6 in 1936. Ad from WHC, April 1936. This Enna Jettick shoe ad from April 1936 featured 27 year old Hollywood star Helen Twelvetrees wearing Enna Jettick shoes. (Ener-Getic! Get it?) Enna Jetticks were aimed at older women. Many other brands promised both comfort and style. I remember similar claims for shoes in the 1970’s. However much they promised comfort, these 1936 shoes are not necessarily “old lady” shoe styles. This Butterick-Companion holiday frock pattern (7155) was drawn on a youthful model and illustrated with fashion accessories: shoes, bags, and gloves. WHC, December 1936. Fashionable shoes and purses for December 1936. Gray or Claret were suggested. WHC, p. 69. These shoes also appeared in WHC ads. Apparently advertisers supplied shoes to the magazine for use in fashion layouts. Nothing new about that! 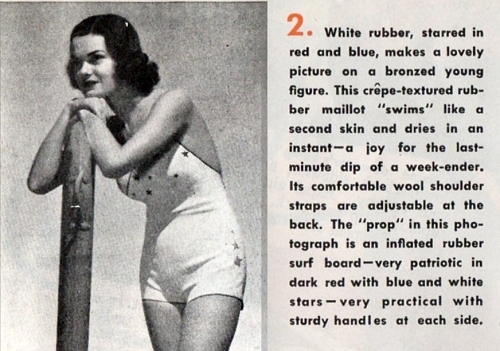 This Walk-Over “Cabana” model, from a October 1936 ad [inset], was available in gray suede and a range of other colors: black, green, brown, and blue. December fashion illustration and [inset] October ad for Red Cross Shoes. WHC. Ads for Selby Arch Preserver shoes are interesting because they always show three women of different ages striding along in chic outfits. Ad from WHC, November 1936. Queen Quality shoe ad, WHC, November 1936. The Bengal, right, looks rather middle-aged to me, but the Lanett pump, top left, has a very high heel. The top-stitched Walk-Over shoe at top right looks a lot like the gray shoe featured in that December fashion illustration. Back to those $3 to $4 Paris Fashion Shoes: They were really inexpensive compared to shoes advertised in Woman’s Home Companion at the same time. According to Woman’s Home Companion, October 1936, a working woman with a college education could expect to earn $18 per week. She was expected to need four pairs of shoes per year, at $3 a pair. Maybe she bought Paris Fashion Shoes! This classic twenties’ cardigan outfit caught my eye because of its animal print (or fur) accessories. Butterick pattern 1345, from March 1927. To the author of the AllWays in Fashion blog, who just wrote “it’s clear many of our old friends are returning for another stylish go-round:” this one’s for you! Synchronicity at work. I found the other outfits illustrated with Butterick 1345 less iconic, although 1349 is also classic. Both have skirts with pleats only on the front. No. 1349 is third from left below. Four Butterick patterns from Delineator, March 1927, page 23. From left, 1345, 1297, “jumper frock” 1349, and 1347, called a “bosom front” dress. In the same issue I found two dresses with an unusual yoke; sheer fabrics were suggested for daytime, which probably means they were afternoon dresses. Butterick patterns for a box coat (No. 1304), worn over a dress with sheer yoke and box pleated skirt (1337;) third is dress pattern 1335, followed by another sheer-yoked dress, Butterick 1331. Delineator, March 1927, page 22. Box jacket 1304 over dress 1337. The very simple jacket is accented with dark applied trim. At right, the dress (1337) is illustrated in crepe silk, with a yoke of sheer Georgette, a crepe-like sheer fabric. Alternate views and text describing Butterick 1304 and 1337. To create a suit-like ensemble, dress 1337 is made using matching fabrics for jacket and dress. From 1927. It was common for 1920’s dresses to have all the fullness in front, with a straight back. Butterick 1337, bolero dress 1335, and 1331. Delineator, March 1927, p. 22. The dresses right and left are formal day dresses, and the one at right could be made in a sleeveless evening version. 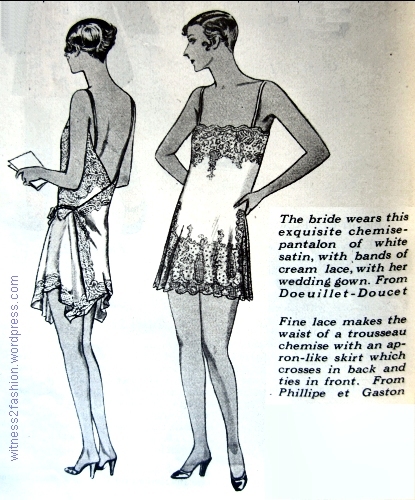 Butterick 1337 and 1331, from 1927. The treatment of the armholes is different, but the yokes are otherwise similar: curved, and low on the sides. They would have been worn over a slip or teddy/combination, so the sheer bodice would have something opaque covering the sides of the breasts. All the models in these 1927 illustrations have severely shingled hair. 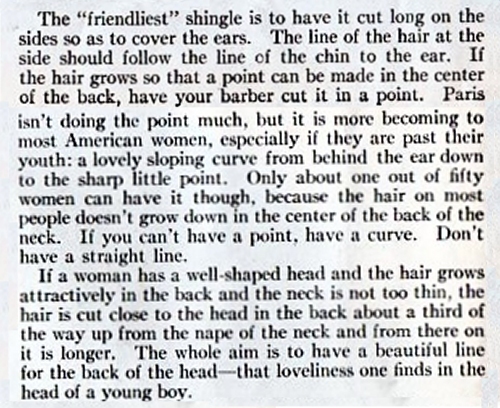 Here’s some shingle haircut advice from 1925. 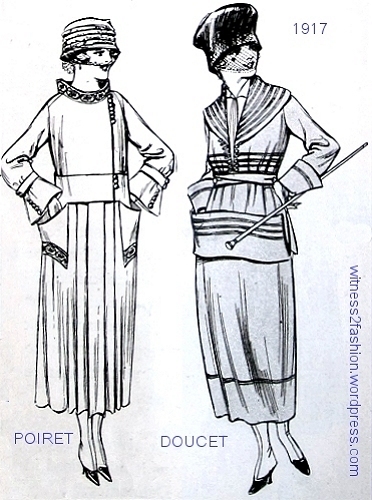 Fashions for women from Butterick patterns, February 1924. Delineator Magazine, page 32. The iconic look of nineteen twenties’ fashions — dropped waists, short skirts, an emphasis on youth — didn’t really dominate until the latter half of the decade. 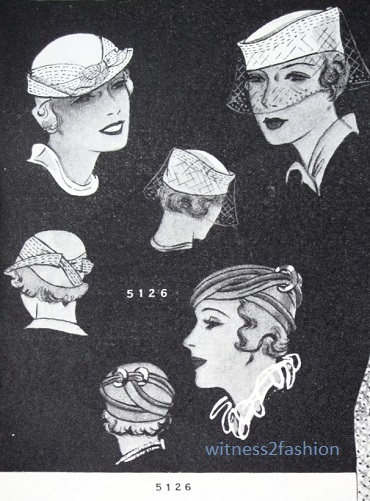 These styles from 1924 don’t suggest flaming youth. Butterick coat 5055 with skirt 4743, from 1924. These outfits from the tubular twenties have very long skirts, just exposing the ankle area. Women’s hemlines are not much changed from 1917. 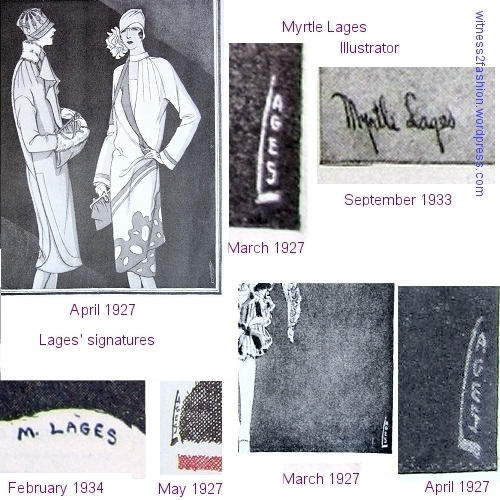 The 1924 Butterick suit coat shown above, from the lower left of the page, not only looks matronly to me, it reminds me of the suits of 1910, although the body ideal is quite different. From The Gimbel Book, 1910, a store catalog in the Metropolitan Museum Library. More suits from The Gimbel Book, a 1910 catalog in the Metropolitan museum collection. The coat is long, the bust is low, and the waist is ignored. 1924. Butterick also sold the hat pattern, a Tam-o Shanter, No. 4886. Butterick hat pattern No. 4886, is worn with a coat (Butterick 5120) and matching skirt (Butterick 4983.) in Delineator, April 1924. Returning to the top of page 32, a “box coat,” elaborately embroidered using Butterick transfer pattern 10181, is at left. The dress worn under it does have a dropped waist. At left, Butterick’s box coat pattern 5052 over dress 4721. From 1924. The outfit at right is made from coat pattern 5051 over dress 4789. Butterick coat pattern 5053 treats the female body as a long cylinder, although this pattern was available up to bust size 46 inches, which assumed a proportionately bigger hip measure. Left, a “coat dress,” Butterick 5054, with embroidery pattern 10191; right, a mannish suit made from “sack coat” 5040, blouse 4790, and skirt 4753. Delineator, Feb. 1924, page 32. The sack coat (as in the traditional sack suit worn by men) is shown with a Butterick hat pattern, 4973. From 1924. 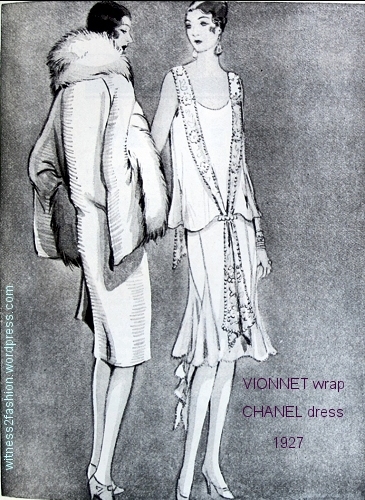 Here’s another illustration of hat 4973, worn by a much more girlish model, from April of 1924. Butterick coat pattern 5032, Delineator, February 1924. 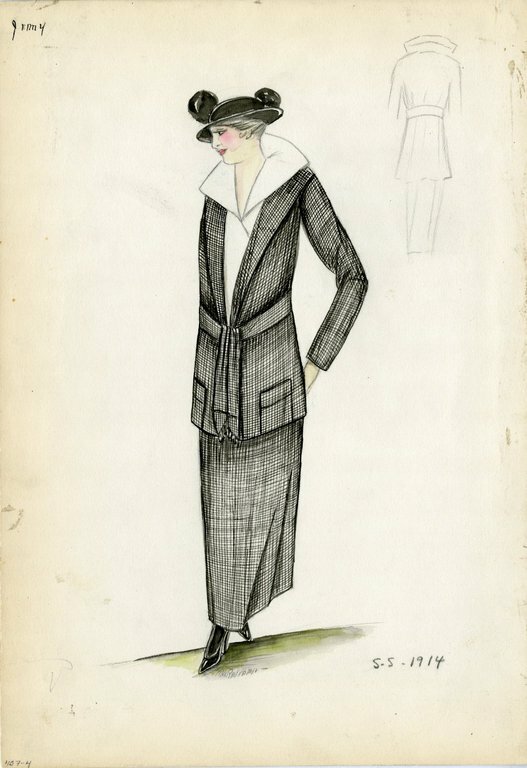 The model is drawn as a teen; her hem shows just a bit more leg, and the coat’s pin-tucked trim on cuff and collar hints at an Art Deco influence. Butterick coat 5032 — with a swirling button — and cloche hat pattern 4973 again. When I look at these styles, I can hardly wait for the “real” twenties to begin. As in the 1960’s, styles favored by young women and teens became dominant as the decade progressed. You could make a complete summer vacation wardrobe — six outfits — for just $25 from a set of Butterick patterns. Delineator magazine, May 1933, p. 69. The Butterick company’s target market in the 1920’s was upscale; there were regular reports on French fashions, and even a new column giving women financial advice during the stock market boom of the late twenties. But in this Depression Era article from May, 1933, the emphasis is on economy. The accessories suggested include some rather elegant shoes, a sweater, and, as explained in the text, only one hat that you couldn’t make for yourself. I’m not surprised that those shoes were expensive. A Store-bought black straw hat for summer, 1933. Delineator, May 1933, p 69. A store-bought sweater and a home-made hat, May 1933; Delineator. Butterick glove pattern 5135, hat pattern 5126, and clutch purse No. 3131. Delineator, May 1933. Notice the extended shoulders on most of these clothes. Butterick Skirt 4908, worn with a sweater and coat 5043; next, dress 5019 in a fine print; “tennis dress” 5104 made in white; and afternoon dress 5095 in a floral print voile fabric. May, 1933. Delineator magazine. In addition, a print suit (a dress plus jacket) and a “Letty Lynton” – influenced evening gown were part of the twenty-five dollar wardrobe. Butterick evening gown pattern 5069 from May, 1933. The stiff, sheer layered sleeves show the influence of Adrian’s design for Joan Crawford in the film Letty Lynton. Butterick jacket dress 5107, 1933. The cost per outfit of making the $25 wardrobe. Delineator, May 1933. Page 69. The cost of the Butterick patterns themselves ranged from fifty cents (the jacket dress or the evening gown) to thirty-five or forty-five cents for the other dresses, and twenty-five cents for the hat pattern, which included three styles. I wonder if the big, stylish buttons were included in the price estimates. In 1936, a woman fresh out of college could expect to earn about $80 per month. According to one article, on this salary, she could even afford to take a vacation…. She can “join a savings club and see the world. Happy landing, we say.” — Woman’s Home Companion, October 1936.